From Paul Tench’s Cameroon diary 2018. Friday 9 February, staying with Ebenezer and Florence Fokam in the Meta town of Mbengwi. Introduced to Mercy Anne Nduku, who will be accompanying us to Bessi-Fomukong. She is the Regional Director of the Bible Society of Cameroon (Bamenda), for NorthWest/West. 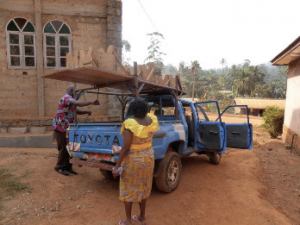 First of all, we had to pick up three benches for the afternoon meeting of the ChristianWomen’s Fellowship from the church.They were strapped to the top of the frame of the pick-up, and away we went.After leaving them at the new CWF building, we made our way to Bessi-Fomukong. It was the bumpiest ride that I’ve had in many a long year; you just have to relax and let your neck and body bounce around as you go along. The scenery is quite dramatic, but the hills and mountains are veiled in the dust haze – you see the outline but not the details. Even the nearer hills and valleys are shrouded in this vague haze, and the roadside grass, shrubs and trees are covered in dust. So on we bounced and jolted until we reached the literacy centre, which is next to the Presbyterian church. This is the centre where Pauline Eyire taught and trained, with Janice Spreda. There was a nice crowd there, although apologies were made that more would have come if it had not been for a funeral the day before.The Fon of Bessi-Fomukong was there and 7 other men, and 11 women, including some who had been trained by Janice.And 26 children – and they were the target of the first address, given by Mercy, after the introductory formalities. She addressed them in Meta with Ebenezer whispering a translation into my ear. She was telling them the story of a girl of 9 who longed to have a Bible and who saved and saved for one until she was 15 – and I realized that she was talking about Mary Jones! 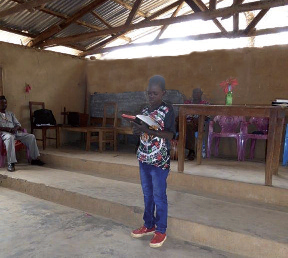 She also tried to inspire the children to see that a child was responsible for the creation of the Bible Society, and then how children have the potential to produce changes. Then the Fon (ie Chief) had his address read for him by the oldest man there who in the past had been the Fon’s right hand man and had strongly supported the Meta translation.There was great for the work that Klaus and Janice Spreda had done.The Fon assumed I was from Germany too, but Ebenezer corrected this in his introduction of me. Then I was called upon to speak and I explained that I was from the very country where that young girl lived, whose efforts led to setting up the Bible Society. I praised the young boy who had earlier read the Scriptures.Had he practised beforehand?Yes, of course, he had, and I emphasized the importance of rehearsing beforehand when reading the Scriptures in public.Not only important to recognize each word, but to see how the words are grouped together, and how the groups make up sentences which tells what has happened.Then to see the meaning of each sentence that make up the passage, and finally to see the main point to be emphasized so that you could read the whole passage like a good story teller – or like a good teacher when reading the letters of the apostles. Then came the exchange of gifts.Mercy presented the Fon with a Good News Bible; I gave him our church calendar and a small book by Don Carson. In return I was given a black Meta cap and a Meta bag.There were enough calendars for the literacy ladies and some of the men. Mercy had all the children come to the front, and she and I prayed over them. Plenty of photographs were taken before lunch was served: pieces of fish in a hot spicy sauce together with yam and cocoyam, followed by grapefruit juice and the inevitable bananas. Altogether, a very happy occasion, with great joy and thanksgiving for all that had been achieved in the past.The people seemed genuinely encouraged to persevere and encourage others to read. and hostel.The shell of the conference centre is complete and roofed.The hostel has reached first floor level. Then time to say goodbye to Mercy as she returns to Bamenda and we head home for a shower and a rest. 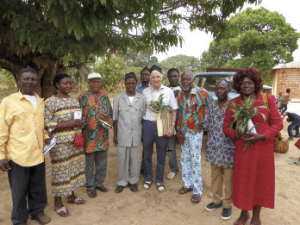 Rev John Fokwa called in the evening; he was the main translator after Klaus and Janice retired, (He now works for the Cameroon Association for Bible Translation and Literacy (CABTAL) as National Coordinator for the equipping of rural church leaders. )Very warm welcome, more like a bear hug!They stayed for the evening meal of noodles with pieces of meat, mixed salad, fresh brown bread, with a banana to follow. Day ended with a time of Bible discussion and prayer, and an electricity power cut!